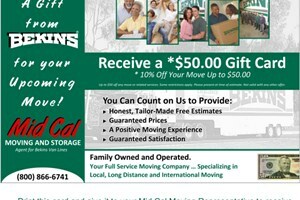 For the safest and most practical storage services in Stockton and the surrounding area, call Mid Cal Moving & Storage. We offer spaces that can accommodate virtually any belongings you may have. Our state-of-the-art storage facility even features open and racked storage for your larger items. We've also take every precaution to ensure the safety and security of your belongings. Our warehouses are equipped with fire and theft protection systems, including sprinklers and 24-hour video surveillance. As a BBB-accredited business with an "A+" rating and thousands of satisfied customers, Mid Cal Moving & Storage wouldn't store your items any other way. Household Stockton Storage: You're welcome to take a tour of our clean, well-organized storage facilities located in Stockton and Modesto. Commercial Stockton Storage: Whether you're moving a small office or a large industrial warehouse, we have the space and expertise to help you conveniently store your excess items. For more information on Mid Cal Moving & Storage and the comprehensive Stockton storage services we offer, call us toll-free or fill out the quote form above for your no-obligation estimate today.